Hanoi (VNA) – The Indonesian sport delegation with two golds ranked first at the total medal tally of the 29th Southeast Asian Games (SEA Games 29) on August 16. It was followed by Malaysia and Myanmar with one gold each. The Philippines was in the fourth place with one silver and one bronze medals, while Vietnam and Thailand came sixth and seventh with a silver. Lao and Brunei each pocketed one bronze. 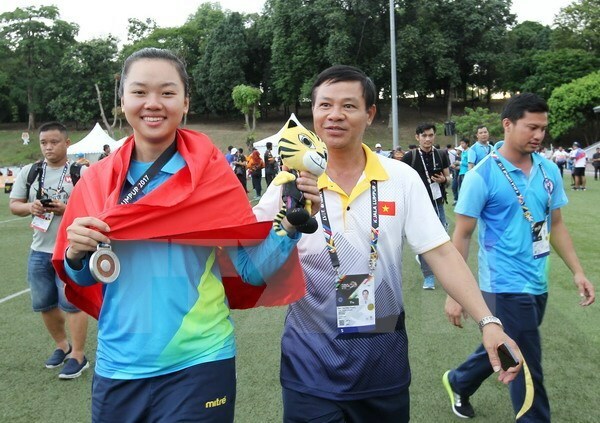 The silver medal of Vietnam was secured by archer Chau Kieu Oanh in the women’s individual three-string bow event. Oanh got 142 points in total, behind her Indonesian rival Sri Ranti with 144 points.